As a tribute to our favorite surf spot and the legendary surfers who have left their mark on the "world's most rippable wave," we bring you the Trestles. The Trestles capture the waves of the iconic spot and the variation of the sandy beach. The classic surf style design, floatability and stunning design make them the best beach inspired fashion item available. On Point Fashion: Hand sanded Zebrawood frames glossed with a smooth wood wax. Floatation: Yes, a dry pair floats! Imported from Central Africa in countries such as Gabon, Cameroon, and the Congo, Zebrawood is a heavy, hard wood with a coarse texture and a decidedly wavy grain. The pale golden yellow base of the wood is intertwined with numerous streaks of dark brown and black wood, and that alternating layer look is why its named Zebrawood. To show this dramatically contrasting grain, Zebrawood is frequently "quarter sawn", a process of cutting round logs lengthwise into four quarters first and then milling from there so the beautiful cross-section of the grain can be maximized for use. Historically, gun stalks, guitars, skis, and the interior woodwork in high-end cars has been done with Zebrawood. Located between San Diego and Los Angeles, Trestles is unencumbered by urban sprawl thanks to its privileged position just inside the north end of the desolate 125,000 acre Camp Pendleton Marine Base. 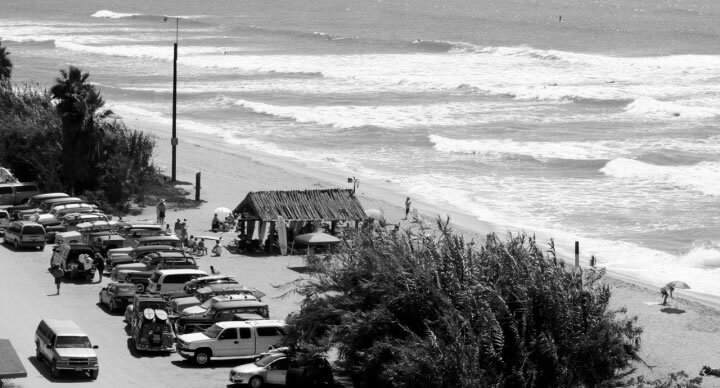 As it was within a US military base, and not even accessible to the public until the 1970s, surfers in the sixties had to sneak onto the beach to surf and try not to draw the ire of the military personnel. While not a common occurance, there are stories of surfboards being confiscated and warning shots being fired over surfer's heads. While this may sound like a bit of an extreme measure to many sports enthusiasts, this was just another step in a long history of surfers being willing to go to the ends of the earth, sanctioned or not, to find the perfect wave. You could definitely argue it was that, and is still today considered one of America's most consistent waves. It's still a major stop on the modern pro surfing tour. Our Trestles wooden sunglasses, handcrafted out of exotic Zebrawood, celebrates the determination and wanderlust drive of surfers to literally go to war for good surf. I really like my wood sunglasses overall. I love the weight and that they float, not to mention how they look. My only disappointment is the etching of "TOWER" on the actual lens itself. I don't know if I'm the only one, but I can't seem to ignore that in the corner of my vision when I wear them. It's almost like a permanent smudge or scratch in a way, at least from the perspective of the wearer. I was a bit surprised that there was anything on the lens as I have not seen that in other sunglass brands. Perhaps others do not mind it as much as I do. This one negative was not enough for me to be really upset or want to return them for my money back. I do like them and plan to use them plenty, I just wish there wasn't that distracting etching in the corner.